The N8LP SteppIR Virtual Control Panel is actually a family of programs. 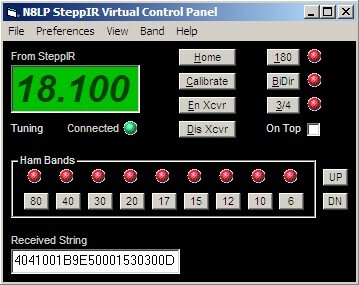 The SteppIR-VCP is a standalone software control panel for SteppIR antennas that can be used to control the SteppIR directly through a serial port. It can be used for remote base station control of a SteppIR through the use of desktop remote control software like pcAnywhere, WinVNC or XP Remote Desktop... or it can be controlled remotely through the use of serial device servers. There is more information about this type of control on my website at www.telepostinc.com/n8lp.html. The other members of the family are SteppIR-VCP-Master and SteppIR-VCP-Slave. These are designed to utilize the remote telnet capabilities of TRX-Manager. TRX-Manager is a very extensive rig control/logging program with extensive remote control capability. In addition to supporting my SteppIR-VCP programs, TRX-Manager also supports remote control of my E-Meter. I am developing other devices for remote contro through TRX-Manager, like my LP-Remote program. My LP-Rotor program also includes a TRX version for remote control. Shown above in one of the three views available in the VCP. Below is the third view, which adds band buttons and a diagnostic window which shows the hex responses from the controller. A third view has the band buttons, but no diagnostic window. The program allows for selection of com port, baud rate and polling rate for status reading. One version also allows reading of frequency from TRX-Manager. This allows General Frequency operation with a remote rig and SteppIR using serial device servers at the remote base site, remote desktop control programs like pcAnywhere, WinVNC or XP Remote Desktop. Standard Manual operation is also provided, where you use the Band buttons and UP/DN buttons to tune the SteppIR. The Band buttons send a frequency 50 kHz from the band bottom edge. Each push of the UP/DN buttons increments or decrements the frequency by 25 kHz. The smaller frequency window displays the frequency sent to the SteppIR controller... the larger one shows the frequency returned from the box. When in the Auto mode, the smaller window displays the frequency received from TRX-Manager. Whenever this frequency changes, it is sent to the SteppIR controller. This "sent frequency" window allows absolute verification that the frequency data was properly received, and always shows the actual status of the SteppIR controller. The same is true of the 180, Bi-Dir and 3/4 status. When changing these modes, the command is sent to the controller, and the "LED"s show the change once it has been received at the controller. The response time of the status verification depends on the setting of the Polling Rate, and the network speed if remote operation is used. The 180 mode has its own button on my VCP so that rapid reversal of direction is possible without having to go through Bi-Dir. These programs are designed to be installed on the Master and Slave computers in conjunction with TRX-Manager. In TRX parlance, Master is the home, or controlling location. Slave is the remote, or controlled location. The two programs use OLE linking to communicate with TRX-Manager. TRX uses telnet to transfer data from Master to Slave sites. At the Slave site, SteppIR-VCP then connects to the SteppIR controller using a RS232 serial interface. The advantage of using TRX-Manager is that a lot of devices can all be controlled over one connection, with error handling to make the link reliable. Required bandwidth is also quite modest, since TRX only sends data that has changed. You can control your rig, rotator, wattmeter (E-Meter), relays and SteppIR... with more to come.